JEDCO designs, fabricates, builds and erects pre-engineered steel buildings of all shapes, sizes and duty purposes. With more than 40 years experience in the business and a solid reputation, you can be confident that skilled craftsman and first quality materials and components are used in your projects. Expect the attention to detail and customer service for which JEDCO has become known. Corporate offices are located in Houston, with a substantial and growing customer base covering the states of Texas and Louisiana. Engineering, design, fabrication and erection services are offered to industrial, commercial and residential builders and developers, as well as residential property owners, farmers and ranchers. 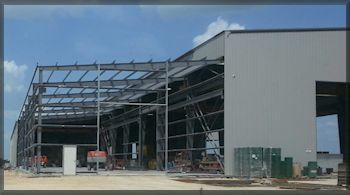 Examples of JEDCO projects are illustrated in this website, including the airplane hangar (photo-right), and the steel building addition in progress (below). JEDCO designs and builds metal building structures such as manufacturing facilities, auto sales and service centers, agricultural, farm and ranch buildings, dining and fast food restaurants, residential storage and garage structures and much more. Please see the listing below. JEDCO's craftsman excel in restorations, repairs, and updates of aging and damaged metal buildings. When space or room additions are needed call for an inspection and quote. In both cases of restorations and additions, every effort is made to match original materials and structural design characteristics. Call JEDCO first when you have existing steel buildings in need of repairs, updates or additions. Repairs and restorations of metal buildings include retrofitting of metal components, replacing damaged structural systems and wall panels, built-up roofs, and much more. Common additions and upgrades are framed openings, doors and windows, skylights, ventilators, gutters and downspouts. Contact us for additional information. If it can be done . . . JEDCO can do it! The sooner you call, the sooner we can get started. Give JEDCO your specs and get a fast quote on your project! Project quotes include a one (1) year workmanship warranty on the materials JEDCO fabricates and erects. JEDCO welcomes opportunities to quote on your metal building projects. Contact us and give us your specifications, timeframes and additional information, and we will take it from there. JEDCO is an approved City of Houston fabricator.